"Christmas Time again?"... Yes, Christmas is just a stone's throw away and, like last year, we have got some huge presents for you! The first one comes from Marc DePulse! 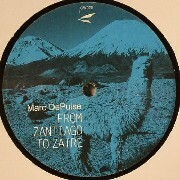 This year Marc takes us on his trip around the world and that's why his vinyl is called "From Zantiago to Zaire". On this vinyl Marc personifies every unprecedented aspect, special feelings & emotions, experiences of previous days and looking forward to what is still to come! Classic elements which display the Detroit Techno, are clearly reflected in this tracks. He celebrates this unbelievable sound in his very own way more than ever :-). There's no way for music to be more profound!! Special thanks are also directed at the wonderful background voice. In this case, the B-side belongs to the remixers, which are Piemont & Plastic Fm who are interpreting Marc's world tour their own way. Combining both pieces (From Zantiago & ToZaire) as a whole, there we go! Thanks go out to everybody involved for this nice piece of vinyl - together we are looking forward to the upcoming Christmas.